A week on from when the UK managed to avoid having an I.S. 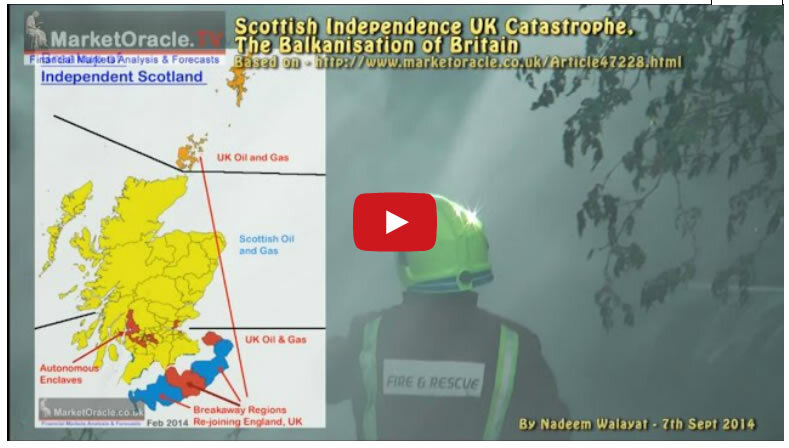 (Independent Scotland) failed state on its northern border, the creation of which would have been literally cataclysmic as an I.S. would have ripped the whole of Britain apart, North, South, East and West as once states start to unravel then events soon gather a momentum of their own where what was thought as unimaginable barely a few months earlier would start to become manifest. The YES Campaigns victory was achieved by means of Westminister politicians LYING to the Scottish electorate by making promises of bribes that amount to effectively INCREASING Scotland's annual net subsidy from England by 50% as the price to be paid by English workers despite having had no say in the matter. Whilst delusional SNP Scottish nationalists appear to be forgetting that they actually lost the election by a WIDE margin of 10% who remain determined in creating their I.S. failed state. Where the focus appears to be one of demanding all of the powers and multi-billion pound promises made by the three Westminister clowns to be fulfilled near forthwith, despite the fact that the Scottish nationalists own fantasy land picture of an Independant Scotland involved lies of several magnitudes greater than that of the three Westminister clowns. My next in-depth analysis will take a look at the prospects for the stock market ensure you remain subscribed to my always Free Newsletter, in the meantime EWI have made available ALL of their premium analysis to our readership for FREE. For one exciting week EWI has thrown open the doors to ALL of their investor services. And it's free. All told, you get complete, subscriber-level access to virtually everything they have to offer investors, anywhere in the world. It includes: from long- to near-term outlook, every major stock index, every major currency relationship, and even precious metals and energy markets, covering: DJIA, S&P 500, FTSE, DAX, CAC40, Euro Stoxx 50, Shanghai Composite, HSI, STI, KOSPI, ASX, EURUSD, USDCHF, GBPUSD, USDJPY, AUDUSD, EURJPY, EURCAD, AUDJPY, gold, silver, crude oil, natural gas -- the list goes on! P.S. This event is open to current Elliott Wave International subscribers and Club EWI members only. If you do not yet have a free Club EWI account, you can follow this link to set up one now. Meanwhile the three westminister clowns despite the UK having dodged a bullet were soon puffed up like peacocks parading this past week as they hooked Grand Britannia into another dubious war with I.S. despite the fact that it was Britain and the U.S. that CREATED I.S.! Have people already forgotten that British agents and the CIA were traipsing around the Libyan desert during 2011 with suitcases full of dollars enticing the Jihadists of Benghazi to go to war against Gaddaffi, and so they repeated the formula in Syria against the Assad dictatorship as they pumped millions of dollars and arms into the Free Syrian Jihadist movements that I covered at length the consequences of in my video of November 2013 of where this trend ultimately terminates. 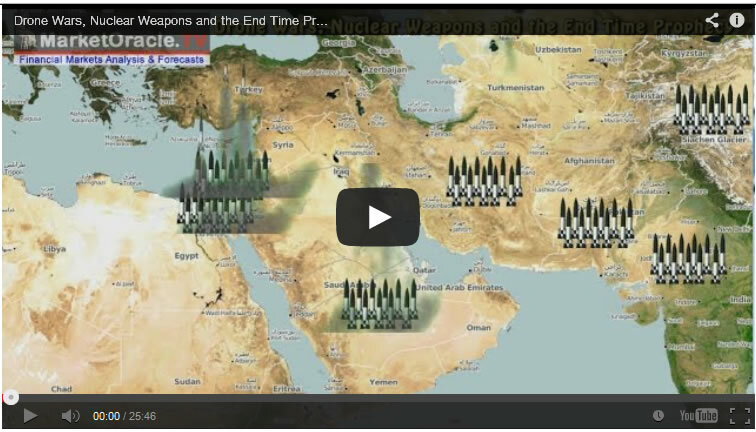 Now the U.S. and UK armed and funded jihadists from Libya, to Egypt to Syria are being used as pawns in the U.S. Military industrial complexes grand chess game of having a war without end for which there always needs to be an enemy to bomb! Look through the smoke screens of lying politicians promises of no boots on the ground and you will see near permanent military deployments across the middle east from Saudi Arabia, to Kuwait to Iraq and now so will Syria be invaded and occupied! Don't believe the LIES! ISIS was fostered into existence by the CIA so that the U.S. could have a backdoor into BOMBING SYRIA! And that is precisely what is now underway. So look at the facts rather than the propaganda. The facts are that Syria IS being BOMBED as this outcome was planned for and worked towards for well over a year! Instead we see our mainstream broadcast BS propaganda of fighting the I.S. menace that apparently was imminently about to attack the US, Britain and the whole of the west with arms conveniently captured from the Iraqi army which makes for good propaganda value to see repeat footage of half a dozen U.S. tanks with black I.S. flags flying rolling down the street on our prime time news shows. Today the US is bombing Sunni ISIS and arming the Peshmerga, fast forward 2 years and the U.S. will be arming Sunni Iraqi's and BOMBING the Peshmerga! .... Russia and China are also on the list. The mainstream media in a frenzy of activity had been painting a picture of the poll being too close to call right upto polling day that had encouraged false expectations for many YES supporters that they could actually win this, whilst similarly it encouraged PANIC amongst NO campaigners, businesses and politicians as they started to contemplate the ramification of the UK effectively being blown up, which prompted the three amigos to rush north of the border and weep for the union. However, I had repeatedly criticised the erroneous expectations as espoused by the mainstream press as according to my ongoing analysis the probability for a NO vote had remained constant for virtually the whole of this year right upto polling day. The Scottish referendum final result was NO 55.30% (2,001,926 votes), YES 44.70% (1,617,989 votes). 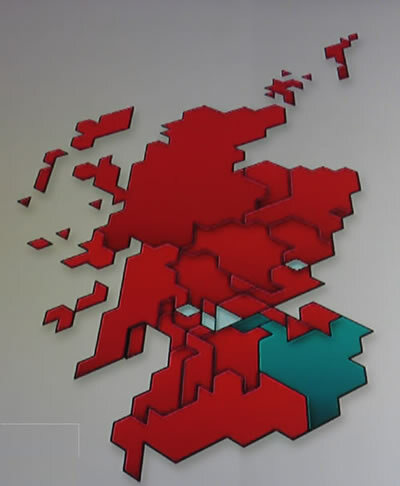 The following map illustrates the magnitude of the SNP's defeat that came nowhere near winning the referendum. Google News apparently indexed my pre-voting article as being posted on the 17th September 2014 as it was posted BEFORE Google updates its time zone (at around 6am GMT). Which I presume may have confused many searching for the result to see that it had been indexed 2 days earlier! Whilst the first mainstream press to report the result were indexed as of 19th September. 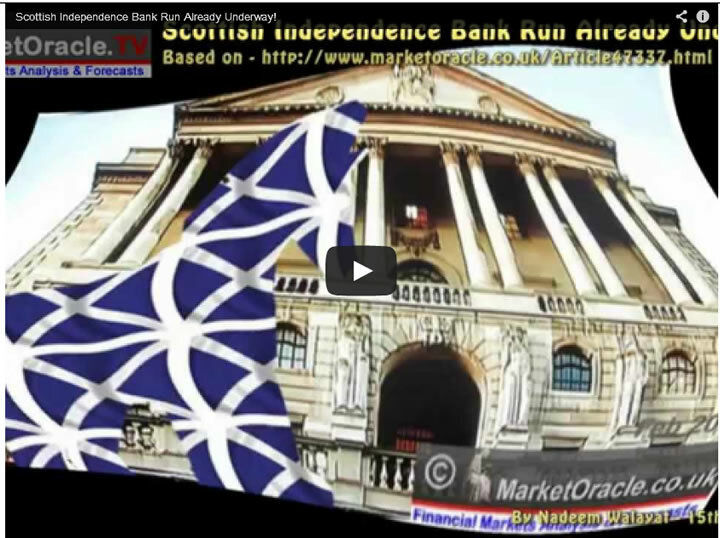 In over a dozen recent articles and 2 videos I explained at length why Scotland would vote NO, such as no currency and Scotland itself would also break apart as strong NO regions would demand their own referendum to rejoin the UK. Westminister party politicians panicked by erroneous opinion polls which were so that the pollsters could sell their services than reflective of actual voter intentions, rushed north of the border to make promises totaling some £4.5 billion of EXTRA subsidy to Scotland on top of the already large annual bribe of a net £9 billion per annum that the Westminister clowns will surely be unable to deliver without triggering much outrage across England's wage slaves. The Scottish Parliament is permanent and extensive new powers for the Parliament will be delivered by the process and to the timetable announced by our three parties, starting on 19th September. The key powers promised that effectively break the union are to both maintain the Barnett formula that exponentially increases the funding of Scottish public services and powers to raise taxes and print debt (money). 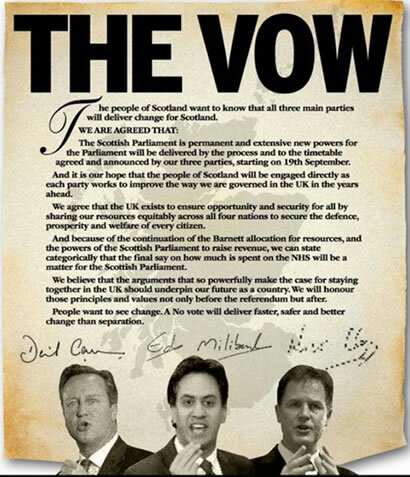 Within hours of a NO vote being confirmed the vow started to fall apart as both Labour and Conservatives start to introduce conditions such as devolution to England to match the powers that were being devolved to Scotland in a parallel process. Scottish politicians are programmed to automatically to blame Westminister for everything that goes wrong in Scotland. The election campaign saw this exaggerated to the nth degree with lies piled on top of lies the most repeated of which was that Westminster would privatise the NHS, which I pointed out was a blatant lie. Another example of a popular SNP lie was blaming Westminster for the food banks, as though food banks were only a Scottish phenomena, and ignorant of the fact that powers, funding and subsidy had already been DEVOLVED to Scotland so that if they chose to they had the means to deal with this issue but the SNP have chosen not to for political reasons. Therefore expect much more of the Scottish disease to play out over the coming years as a consequence of devolution as a consequence of having a parliament which is financed by the UK and increasingly the same from Northern Ireland and Wales. The bottom line is that both YES and NO politicians lied to the Scottish electorate, its just that the nationalists YES politicians lies were of several orders of magnitude greater than those of the NO campaigners, completely detached from any resemblance of reality by painting a picture of paradise when the reality would have been one of an economic and financial hell for a nation that would not even have a currency! The timetable for effective home rule for Scotland by the end of January 2015 is IMPOSSIBLE to achieve, it is especially not going to happen in a UK General Election year as effectively English MP's would be voting for more powers for Scotland whilst not devolving any powers to England's regions that already results in a huge disparity in representation. The consequences of failure to meet the promised time table for effective Scottish home rule would be for Scottish nationalists to once more make demands for an Independence referendum, which would be coupled with street protests by the Salmond youth that could spark civil unrest in the run up to the May 2015 general election, of which we only caught a glimpse of on the day after the Scottish referendum when unionist demonstrators emerged onto the streets of Glasgow to reclaim Independence Square which included skirmishes between unionist and nationalists supporters. Alex Salmond deciding to step down from the SNP leadership now negates his statements of not having another referendum for at least a generation as no longer being relevant for his successor (Nicola Sturgeon) who can demand her own referendum. The West Lothian Question - England a Scottish Colony? Is the question posed by MP Tam Dalyell in 1977 on the consequences of devolution. Why should Scottish MP's vote on Westminister matters that only effect England as those matters had been devolved to Scotland whilst English MP's cannot vote on those Scottish matters. We see the consequences of this today in that Scottish MSP's have voted to give the Scottish people advantages such as free prescriptions, eye tests and free university education amongst many others, whilst Scottish MP's can vote against England having the same services which is tantamount to England increasingly becoming a colony of Scotland as Scottish MP's can vote to extract a ransom (subsidy) from England to finance advantageous services in Scotland whilst denying the same to England, leaving English workers forced to pay the Scotland tax as a consequence of Westminister politicians incompetence in bringing about the situation that has been further exposed by latest bribes to Scotland / tax on England. However, the answer to the west lothian question of preventing Scottish MP's from voting on English matters would inevitably result in the demise of the United Kingdom as it would play into the hands of the Scottish Nationalists who would gain much propaganda value from the two tier of MP's which would cripple the Labour party who despite winning a General Election would be a minority in England and thus would be prevented from governing on English only matters. Peoples of the regions of England are waking up the huge disparity in powers and state funding between their regions and Scotland. For instance Yorkshire is of similar population and economic size to Scotland but suffers a huge disparity in the powers that the local people can exercise in day to day living over state funded services and local issues where Yorkshire has zero devolved powers whilst Scotland has approx 20%, with Devomax set to increase this to approx 40%. The consequences of which is that Yorkshire suffers a £10 billion disparity to Scotland in terms of state public sector spending from schools, to health services to infrastructure projects that following DevoMax could rise to as as much as £15 billion per year disparity, and the further north one goes the greater the disparity becomes right upto the border with Scotland. Whilst today's news is focused on Scotland the truth in terms of representation is that Northern Island enjoys the most representation and thus most public sector funding per capita through a whole host of local bodies with Scotland followed closely by Wales and then a big fat zero for England, where the further one moves outside of London the less voice the people have in their day to day lives, most of whom are literally treated as serfs to vote zombie style for either Labour or Conservative, as is the case for the voters of the peoples republic of South Yorkshire where no matter how disastrous the Labour politicians were such as recently exposed in Rotherham, nevertheless they people are still expected to turn out and vote Labour zombie style. My recent housing market ebook (FREE DOWNLOAD) illustrated the potential for the emergence of several new mega cities across England if power to act for instance in terms of planning rules were amended to meet different regional requirements i.e. devolved from Westminister. Such devolution would not require an new assemblies to be created but powers devolved to existing bodies such as City and County Councils. 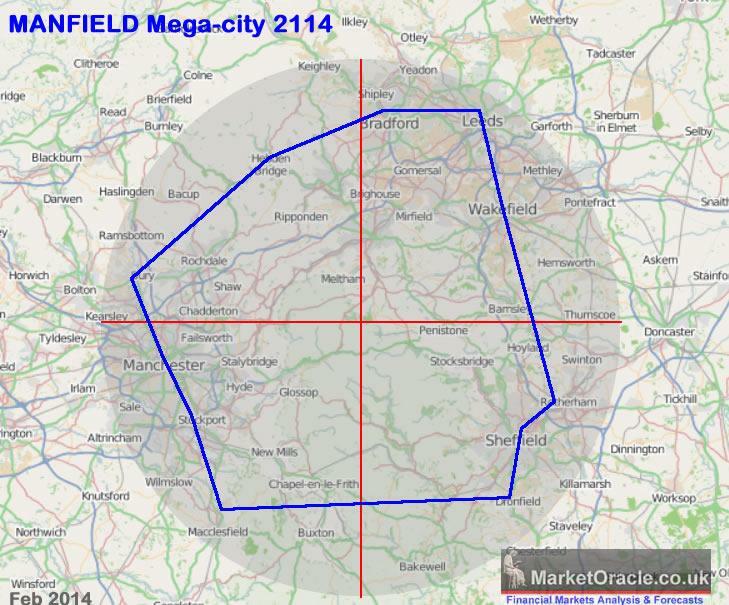 Whilst it is beyond the scope of this ebook to analyse all of the potential new central hubs around which mega cities could form, however my analysis of the new yet to be named mega-city of the north, MANFIED illustrates what is likely to occur in at least 2 other such areas of Britain over the next 100 years or so. The area of Manfield of equivalent size to present day London already has a population of over 3 million which gives it a real possibility of reaching an inter connected critical mass that will start to coalesce around its new central hub, so that instead of new mega cities expanding London-esk from out of existing city hubs over thousands of years, they are more likely to start to emerge around these NEW central hubs as that will represent the shortest and quickest route of travel between the merging spokes and hence drive concentration of people and infrastructure towards their centres that would have ample space to accommodate soaring demand. Whilst many today may argue that this just cannot possible happen due to the mass of green belt land comprising much of its area, but that is also to its great advantage for all it would take is a bill in Parliament that would illicit far less local opposition than such a move would elsewhere given the long standing desire for a Northern mega city to rival that of London. Furthermore, using the latest technologies and design techniques to mesh together transport, telecommunications, energy, and water links of all of the cities around the new central hub would ignite a decade long national construction led economic boom, creating hundreds of thousands of new jobs. The resulting boost to the British economy would be such that many would wonder why it had not been done several decades earlier and thus spark several more similar projects elsewhere, where perhaps 100 years from now Britain may well be on the path towards having built as many as 4 new technologically advanced mega cities of which some could even surpass London in terms of economic output. 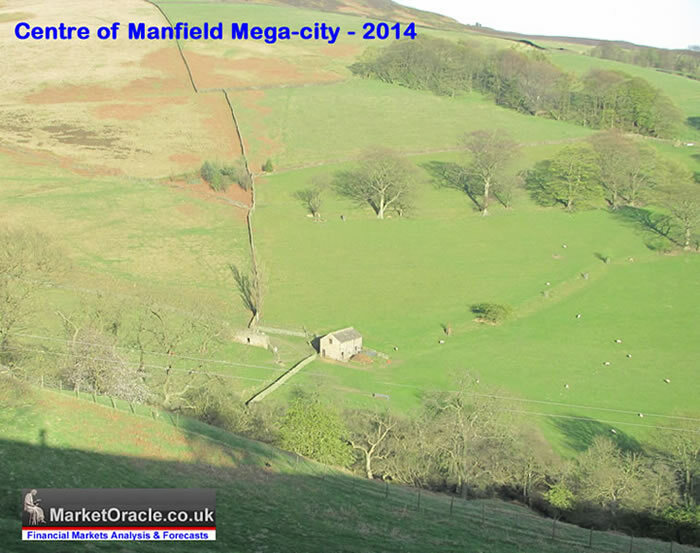 The bottom line is that land and properties in the central hubs of the new mega cities such as Manfield are up for grabs at bargain basement prices, which whilst personally one may be unlikely to profit from their emergence during ones life time (barring a nano-tech solution to telomere shortening), however future generations will erect statues towards ones investment insight in future land and property investment planning. The main reason why devolution to the English regions would not work is because they lack regional identities i.e. the North West region's people don't identify themselves as being North Westerners as many Scots identify as being Scottish, so likely will be far less likely to want to be under a central regional authority that they will be even less inclined towards than Westminister. Even a presumed single identity region such as Yorkshire is not uniform for there the split is between North, South and West where for instance the people of Sheffield (South Yorkshire) would not want to be governed from Leeds (West Yorkshire) despite being just 30 miles distant or worse York (North Yorkshire) some 80 miles away but expect their regional authority to reside within South Yorkshire, therefore implies county level fragmented representative bloated public sector devolved authorities if not all the way down to city level devolution. Even if the people coalesced around, say 10 regional assemblies then this would still result in bloated bodies for instance it would mean some 1300 new members of English assemblies and associated infrastructure at huge annual cost to maintain of at least £5 billion! That is £5 billion lost annually to a new tier of politicians and their staffing and housing requirements whose purpose would be to create more red tape so as to differentiate one region from another. Furthermore regional assemblies would increasingly look to demand similar powers and funding of that of an Independent Scotland just as Wales today is demanding the same level of Devolution if not better than the deal that has been promised to Scotland. This is an even more crackpot idea than English devolution to regional assemblies, leaving aside where it would be housed and associated costs the problem here is that it would create the role of a rival prime minister, the First Minister of England. How would the UK work were there effectively 2 prime ministers ? The answer is it would not and the UK would soon cease to exist as the First Minister of England would effectively demand all of the powers that the Prime Minister held in their name, much as Yeltsin did to Gorbachev as the Russian Federation seized all of the powers of the former Soviet Union and all Gorbachev could do was agree to the decrees, and so it would be for the UK as its last UK Prime Minister would be forced to hand over all powers to the English First Minister and thus end the United Kingdom. The other big problem is that the net subsidy of currently £9 billion to Scotland would mushroom to near ten fold as the cost of devolution. So where would that extra £80 billion of annual government spending come from ? It would be printed by HM Treasury (bonds) of a weakened UK central state that would have devolved at least 20% of its powers. That £80 billion would be ADDED to the existing deficit of £95 billion resulting in Britain's deficit jumping to more than 11% of GDP with the debt mountain further accelerating away. Here's a s reminder of George Osbourne's OBR budget deficit forecast made right at the beginning of the Coalition governments term in office (June 2010) that stated that the UK deficit would be cut to £20 billion by the time of the next general election which as I stated at the time was not going to happen as my analysis at that time concluded that the coalition rather than reducing the deficit would go on an extended borrowing spree as they attempted to ignite a debt fueled economic recovery into the Mid 2015 general election. The following updated graph for UK public sector net debt clearly shows that the UK government has hit a deficit cutting road block because instead of the deficit falling to around £60 billion for 2013-14, the actual figure after much fiddling came in just under £100 billion. Furthermore the trend for persistently high deficits is expected to continue all the way into the May 2015 general election as the Coalition government further ramps up deficit spending to buy votes, therefore there is a high probability that the deficit could yet expand further, the net effect of which would be for a total additional debt of over £100 billion beyond the governments expectations to be added to Britain's debt mountain and this before adding the £4.5bn of more free money for Scotland and before pricing in the cost of English devolution. The consequences is that that even with Bank of England money printing monetization of Britains debt, interest rates would rise and inflation would soar to cover the consequences of £80 billion of extra money printing per year that would result in at least an average inflation rate of 6% per annum and I would not be surprised that a currency panic would result in a spike above 10%. Furthermore the UK central state would effectively be crippled as there would be a constant risk of further erosion of central powers as the regions demanded parity with one another in terms of disparities in funding and levels of devolution. Such a disunited kingdom would suffer in terms of credit worthiness and attractiveness in terms of an investment destination and haemorrhage capital and as the currency falls so would inflation rise.